What has 16,575 miles of paths? Has saved £88 million through reduced road congestion? And has contributed £2.5 billion to local economies through leisure and tourism? These are the claims by Sustrans for the National Cycle Network in their review for 2018. 5,000 traffic-free miles have been created in the last 23 years. The ambition now is to create a further 5,000 traffic-free miles in the next 22 years. The review recognises that only 1.5% of the land that the paths run on is owned by Sustrans, the rest is owned by others. 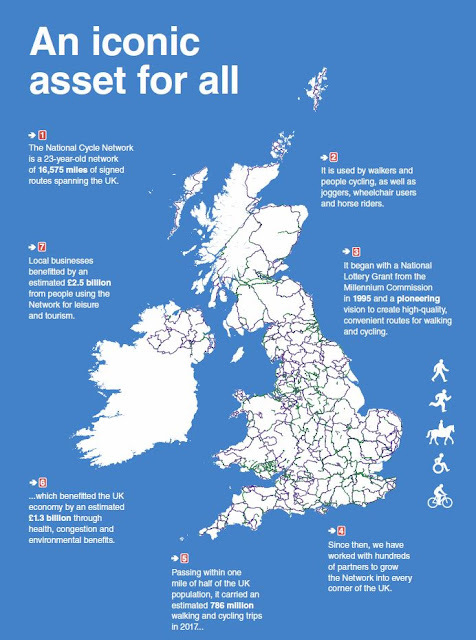 The review says that Sustrans will now work in partnership with local authorities, private and charitable landowners, national governments, agencies, users, local communities and all the many organisations that make the Network possible to turn the recommendations into reality:. It is hoped that the report will inspire the general public to help Sustrans ensure a bright, exciting future for the Network that covers the UK, by becoming stakeholders, supporters, volunteers and community friends to turn their vision into reality. The report says that landowners are not obligated to improve the Network, but during the review, they asked for coordinatization of all stakeholders around a plan to protect the National Cycle Network brand and to improve the Network for all users. Insufficient and inconsistent funding for maintenance has been a significant contributing factor to the inconsistent experience for users of the Network, so in addition to fixing the current shortcomings, Sustrans will work with others to ensure the regular maintenance of the Network to agreed standards and clarify who is responsible. They will work with their volunteers to support landowners, where appropriate. Visit the interactive map at Sustrans to leave a comment. Path number 6 runs through Houghton Regis and Dunstable. There has been a lack of clarity on the quality standards that should apply to the Network. This has been addressed in the review. Sustrans will now work with partners to ensure that any additions to the Network adhere to these standards and that they underpin improvements to the current Network; recognising that there may be both exceptions for critical and physically constrained parts of the network. 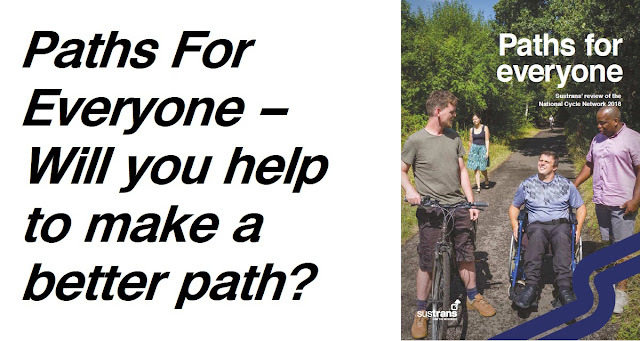 Sustrans will also work with partners to potentially de-designate some parts of the Network. Delivering 15 recommendations will transform the National Cycle Network, producing more traffic-free miles, quiet-way miles, and on-road miles. 1. Set the tone for harmonious use of the Network by everyone. 2. Remove or redesign all 16,000 barriers on the Network to make it accessible to everyone, with no barriers in place for continuous travel. 3. Transform the Network by replacing existing on-road sections with new traffic-free paths or by creating quiet-way sections so it is safer for everyone. 4. Ensure that where the Network is on a quiet-way section the speed limit is 20mph in built-up areas and 40mph in rural areas. 5. Improve safety at crossings where the Network crosses roads or railways. 6. Adopt a new quality standard to ensure path widths and surfaces are built for everyone. 7. Improve signage so everyone can use the paths without a map or smartphone. 8. Deliver over 50 activation projects across the UK by 2023 to improve the Network and demonstrate change. 9. Introduce a process for de-designation of parts of the Network that cannot be improved – and a clear process for incorporating new routes that fill gaps or make new connections. 10. Make it easier for people using the Network to feedback on its condition – and use this insight to improve it. 11. Promote the Network to new users. 12. Encourage greater community involvement in designing, developing and maintaining the Network. 13. Provide open data on the Network. 14. Report regularly on the impact of the Network in improving everyone’s lives and places. 15. Establish clear governance to bring together land managers, funders, users and others to deliver these recommendations in partnership.